They are seen working in the community. Charlie T. RiverDog is seen all over the Lowcountry. Stories are told about how much fans love coming to The Joe and how much the local organization means to the area. In that local spirit, the organization has announced a formal relationship with Lowcountry Local First for the 2011 season. The mission of Lowcountry Local First is to advocate the benefits of a local living economy by strengthening community support for independent and locally-owned businesses and farmers. Part of the RiverDogs’ involvement with Lowcountry Local First will consists of locally owned businesses having the opportunity to provide information and promote awareness through various table displays near the entrance of Joseph P. Riley, Jr. Park on Saturdays. Fans who come to the ballpark for Saturday home games will not only have the chance to interact with those local businesses, but if they show proof of residency in the Greater Charleston area, they’ll receive $1 off their ticket purchase upon entering The Joe. Lowcountry Local First is an alliance that educates the public on the importance of supporting the local economy, and encourages businesses and consumers to be environmentally sustainable and socially responsible. They are the 44th network of the Business Alliance for Local Living Economies (BALLE), North America’s fastest growing network of socially responsible businesses that are comprised of more than 80 community networks representing 22,000 independent business members across 30 states and Canadian provinces. These networks create local living economies through the building blocks of independent retail, sustainable agriculture, renewable energy, green building, local zero-waste manufacturing, community capital, independent media and local arts and culture. SI Yanks Help Major League Umpires Make ‘An Easy Call for Kids’! New York, NY- The Staten Island Yankees are among the more than seventy Minor League Baseball (MiLB) clubs participating in the 3rd Annual UMPS CARE Charities Online Auction. Fans can win luxury suites and blocks of 24 tickets at an incredible savings from 66% to 85% off of the retail value or gate price. The 12-day online auction, with more than 200 items, is currently underway and closes Sunday, March 20. Sports fans can visit and win items at: www.biddingforgood.com/UmpsCare. Proceeds from the online auction help to provide Major League Baseball experiences for children awaiting adoption, Build-A-Bear Workshop® experiences for children with cancer, and college scholarships for young adults who were adopted as children. In addition to MiLB suites and tickets, the auction also includes 2011 MLB All-Star Game tickets, the chance to watch batting practice from the field at a variety of MLB stadiums, Green Monster seats for a Red Sox-Yankees game, the chance to go behind-the-scenes at ESPN Baseball Tonight or play golf with ESPN’s Scott Van Pelt, 2-night hotel with ticket packages, dinner with financial guru Guy Adami after a taping of CNBC’s hit show Fast Money, a Pinehurst Resort Golf Experience with PGA Teaching Pro Dan Kochevar, memorabilia signed by President Obama and both Presidents Bush, and a selection of signed golf and football memorabilia. Special “Bid for a Buck” auctions, contests, and giveaways will be announced via Twitter and Facebook throughout the 12-day event. Items starting at one dollar and available for a day or less will include game tickets, sportswear, memorabilia, and gift certificates. Follow UMPS CARE Charities on Twitter and Facebook for “Bid for a Buck” details. Of course the real winners are the children served by the men in blue of UMPS CARE Charities. UMPS CARE Charities is a 501(c)(3) non-profit established by MLB umpires to provide financial, in-kind and emotional support for America’s youth and families in need. 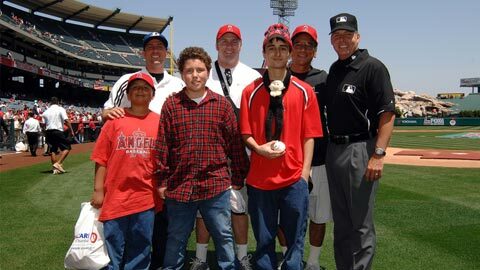 Since 2006, umpires have provided memorable baseball experiences for more than 4,000 children awaiting adoption and at-risk youth in mentoring programs. They have also hosted more than 50 children’s hospital events to provide Build-A-Bear Workshop experiences for children with cancer and other serious illnesses. Learn more at UmpsCare.com. This article originally appeared on the official website of the Island Yankees. Click here to view the original story. The Stockton Ports teamed up with the California District 8 Little League to help enrich the lives of Stockton youth through the gift of baseball. The Ports and District 8 Little League announced that Eastern Little League had been selected as the recipient of a grant that helped with field renovation. The grant, worth $1,146, went to the renovation of the East Side Community Park in Stockton where the Eastern Little League plays. The Ports have worked with California District 8 Little Leagues in the past, with the League being active participants in the Ports Little League days. The grant, which was from the Player Fine Money distributed by the California League, marks the first time the Ports have partnered with the League to renovate a field. In addition to the Ports grant, We Paint donated all painting supplies and a free power washing to the renovation efforts. “We are proud of the relationship we have established with our area little leagues and are looking forward to being able to give back to the league by improving their field for the upcoming season.” said Tim Pasisz, the Ports Director of Business Development and coordinator of the team’s youth baseball programs. The Ports front office staff donated their time to help with the renovation on March 5. The Ports spent the morning tearing down the worn and broken fence surrounding the little league field. The 2011 Reading for Rewards program, presented by Wells Fargo, concluded on Friday, March 4 with the final assembly at Wilson Elementary School in Corona, California. Over the course of the reading program, Thunder visited 13 different cities and worked with over 100 local elementary schools, totaling 103 live performances. All students attending a school performance received a “Go Thunder Green” book. Additionally, schools that missed out on an assembly will receive a Reading for Rewards bookmark that the students and their parents will fill out, return to their teachers and eventually redeem for two free Storm tickets for their accomplishments. In total over 65,000 bookmarks were distributed to local students. 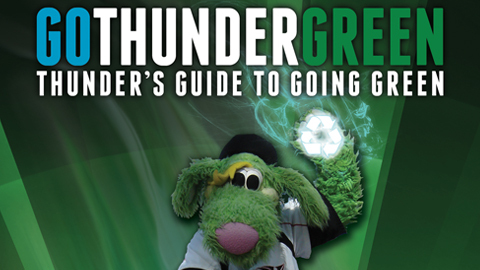 “Go Thunder Green: Thunder’s Guide to Going Green” was produced, written and illustrated by members of the Storm front office staff at the end of the 2008 baseball season. The book contains a five stanza introduction revealing Thunder’s efforts to help the world by “Going Green” as well as a poem that details Thunder’s eight tips to help our environment. “We reached more students this year than ever before,” said Storm Director of Mascot Operations Patrick Gardenier. “On behalf of Thunder, I would like to say thank you to everyone that was involved in this year’s reading program.” Students can redeem their ticket vouchers for the following dates: Sunday, April 10, Friday, April 22, Sunday, May 8, Wednesday, May 18 and Sunday, May 22. Opening Day is only a month away, and Lexington Legends fans showed Saturday that they are ready for a new baseball season. Despite the cold, rainy weather, several hundred fans turned out at Whitaker Bank Ballpark for the Legends’ annual Fan Fest. Games and a variety of free food were offered, and the Legends teamed up with the St. Baldrick’s Foundation to raise funds in the fight against children’s cancer. The St. Baldrick’s Foundation is a volunteer-driven charity committed to funding the most promising research to find cures for childhood cancers and give survivors long and healthy lives. Since the first St. Baldrick’s event in 2000, five principles have directed the Foundation in its quest to Conquer Kids’ Cancer: integrity, efficiency, transparency, pioneering spirit, and sense of fun. This foundation was a perfect fit for the Lexington Legends. Nine Lexington people had their heads shaved in a show of support for children undergoing cancer treatment, and more than $2,000 was raised for St. Baldrick’s. Hair stylists from Bak 4 More Studio were at the ballpark to donate their services and a monetary amount to assist the Foundation.